Posted by Jon in MOTUC, Toys with 2 comments. Do you want to enjoy Masters of the Universe Day to its fullest extent? What is Masters of the Universe day you ask? Well you see back in 1987, LA Mayor Tom Bradley declared April 28th “Masters of the Universe Day.” Since this is the most powerful day in the universe, a team of bloggers including myself decided to celebrate by putting together a bunch of reviews and memories for the collective internet to enjoy. So again I ask, do you want to enjoy MOTU day to the maximum? Then you need to check out all of these sites as there is lots of Masters goodness today. And really every day, because He-Man is an easy fall back for most of us. Check out Phil’s site for a bevy of MOTU related posts! Every MOTU Review done at Battlegrip. Check out Hoard World for some great MOTU content! 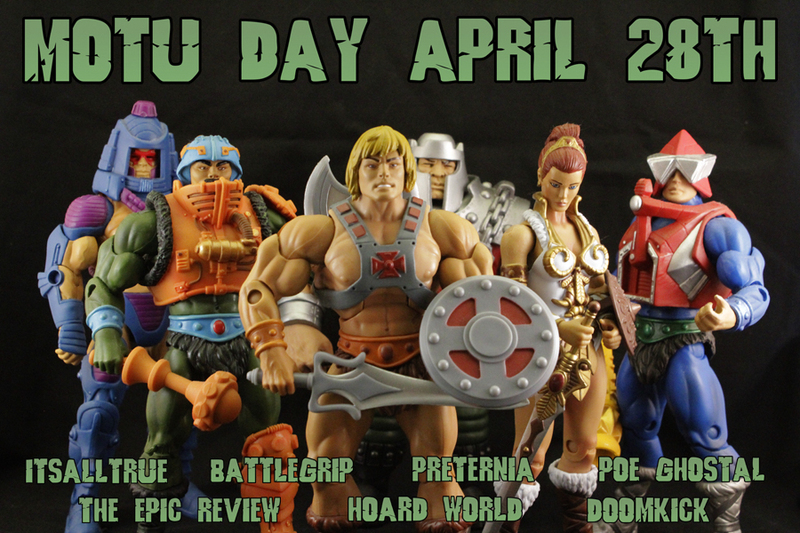 What to do on MOTU Day! Check out Poe’s site for some sweet MOTU posts! I’ll update as the day goes by as well with any additional links. I’m just a lunatic who gets up at 5 AM to put these up, normal people sleep. Wow did you know that a few years ago there used to be a TV series i’m sure of it i mean i didn’t watch it anyway as I’ve been into other things such as LOTR and Hobbit for nearly all of my life but i sort of like the toy spin-offs that Mattel do as MOTUC is sort of similar as i always imagine the castle Greyskull to be like helms deep or something else like the mountain weather top but no i sort of like MOTUC don’t get me wrong but i could never aspire to get all of the MOTUC figures as there is already so much i have missed out on and so many of them to collect but i think my friend Ryan likes them so i will tell him of this site as he likes this sort of Fantasy-Sci-Fi thing!! but anyway thanks for posting this Jon and good job!